Stay safe with Designated Driver, a non-profit driving service that drives you and your car home safely. It's one of the safest and easiest ways to get you home without worrying about expensive cab fare, leaving your car unattended, or using other services. It's supported by donations and local business sponsors. Highly recommended. The BBB of Southern Colorado promotes and fosters the highest ethical relationship between businesses and the public through voluntary self-regulation, consumer and business education and service excellence. Phone (719) 636-1155 or toll-free, 1-866-206-1800. "It's Just Good Business." Plumbing Roofing Mortgages Auto Dealers Franchised Heating and Air Conditioning Contractors Construction Remodeling Home Improvements Auto Repair Insurance Carpet Cleaning Home Builders Painting Contractors Services Financial Planners Moving/Storage Windows and Doors Business to Business Real Estate Services Landscape Services Complaints. One Nation Walking Together makes a positive difference in the lives of Native American living on reservations and provides programs for urban Indians. They rehabilitate communities by improving shelter and providing humanitarian programs. They promote public awareness of the plight and aspirations of Native Americans. They reclaim merchandise and equipment which would otherwise go to landfills and use the same to assist with Native American community development efforts. Provides information and assistance for leisure travelers and planners of conventions, conferences, exhibits, reunions, motor coach travel, area attractions, accommodations, recreation etc. The Kingdom of the Outlands is the twelfth of the Laurel Kingdoms of the Society for Creative Anachronism, Inc.
National Organization of ship suppliers who service and supply ocean vessels that call on all ports in the United States. Silver Ponds Home Owners Association, 7075 Silver Ponds Heights, Colorado Springs CO 80908. 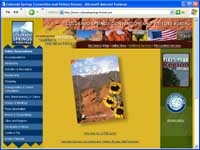 ByLaws, Covenants, Financials, Lot Diagrams, Contracts, Meeting Minutes and Water Reporting. Serving the hungry, homeless, and hurting in Jesus name.